Cool and Cute Soccer Christmas Gift Ideas for Girls. EASY text box templates to type Her Name and Jersey Number or her MONOGRAM. After Clicking on the Soccer Gift, you will be directed to my “Zazzle Shop”. To the right of each item is the “Edit this design template” section with the Text Box Templates. CLICK “More” to see all text box templates. Really Pretty Personalized Soccer Gift Ideas for Girls. They make great Soccer Gifts. Just Highlight the temporary text and type in YOUR TEXT or DELETE it totally if desired. 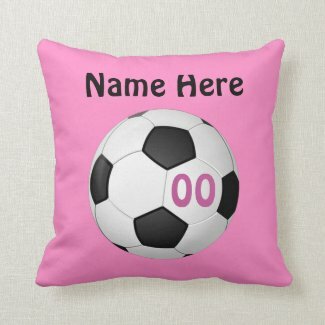 Pink is so popular and so are soccer gifts for Girls Bedroom decor. Zazzle keeps coming out with new and cool personalizable gifts. They are cute, simple and so memorable. 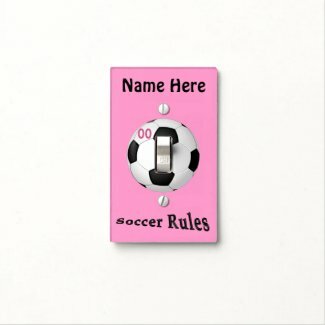 More Soccer Room Decor for Girls too, such as blankets, Decals, Posters and more. I love the new Soccer Mini Hoop. Practice shooting your garbage into your garbage can and have a cute soccer decoration for your bedroom. 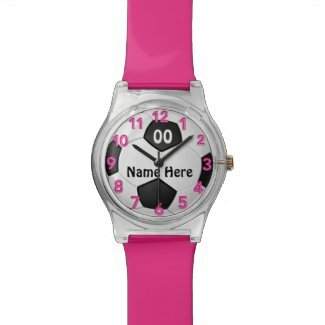 She will enjoy this PERSONALIZED Pink SOCCER Gift Ideas for Girls. She can enjoy cuddling up and relaxing on her Totally Personalized soccer throw pillow and matching throw after a tough Soccer Game. PERSONALIZED Pink SOCCER Christmas Gift Ideas for Girls. Sports Watches for girls. Change the Colors of the mix and match soccer watch bands. Cool colors to choose from in the Style Options area to the lower right of the soccer watches for girls. You can also choose a totally different style. Lots more Soccer Gift Ideas for Girls, Boys, Men, Women, Coaches and Soccer Mom. Click on this Soccer Stuff Category to All of Little Linda Pinda Designs Personalized Soccer Gifts. Soccer Gifts for that very special Soccer coach. Personalize the coach Mugs. Kids will love these funny soccer coach gifts. I also created gifts for children with this cute soccer face. It will be so much fun to look at your coach’s face when they open up their coach gift. Buy with Confidence. 100% Guaranteed, Less than 1% of merchandise is ever returned and A+ Rating from Better Business Bureau. Really cool Soccer Gifts. Amazingly crisp and clear printing and 100% Guaranteed with an impressive fewer than 1% of products Returned. I love the fact that the Better Business Bureau gave them an A+ Rating. Check it out at BBB.org. Can you answer these Soccer Questions? See RED ANSWERS BELOW. http://www.usyouthsoccer.org/aboutus/FAQ/ Some of the information came from US Youth Soccer. 1. How Many High School Players are on a Soccer Field for each team? 2. What Size Ball is used? 3. Do you have to wear a mouth guard in youth soccer? 4. What is the Size of High School Soccer Field? 5. What is the Size of a Professional Soccer Field? ANSWER: 11 including the Goal Keeper. 10 players on the field and 1 Goalie. Many teams will typically have about 15 to 18 players to cover for injuries. ANSWER: 8 years old and younger play with the Number 3. 10 years old through Under 12 years old play with the Number 4. Players Under 14 years old to Adult use the Number 5. ANSWER: According to US Youth Soccer.org, Mouth guards are not required because there are very few tooth injuries in youth soccer. Dentists however do recommend a mouth while playing soccer. 4. What is the approximate size of a High School Soccer Field? ANSWER: Approximately 100 yards by 60 yards. So the high school soccer field dimensions in feet would be 300 feet by 180 feet. See lots more Personalized Soccer Gift Ideas for Girls and the whole family. We specialize in design personalized soccer gifts for girls, boys, coaches, men, women and even soccer dogs. CALL or TEXT me, Linda, at 239-949-9090 if you would like me to create a custom soccer gift for you. I can make it with your school colors or your soccer bedroom decor colors as well. There are so many options I would love to help you. I really appreciate and want to Thank you for visiting our Soccer Gift Ideas for Girls. I love creating personalized sports designs for everyone. It is so much fun to give personalized soccer gifts for girls and boys. It is even more fun receiving these cute soccer gifts. Please feel free to CALL or TEXT or Email Linda if you have a special request or if you need HELP customizing any of my designs. I will be happy to help you or even put one of my designs on any of the thousands of Zazzle products. Thank you. Designing is such a joy for me. I would love to create a special gift for you.